One of the first designs that Phill came up with for Flyte so Fancy were the Feeder Shelter / Dustbaths for chickens. A simple, elegant design it did its job so well, that once photos were taken of it, way, way back in 2006, it was deemed job done. Over a decade later it was decided that perhaps it was time, as good as the photos were, to get some updated snaps for the website. The added arrival of our new Curved Dustbath and Shelter, as well as our new Playsand for Chickens for extra luxuriant dustbaths, made it seem to good an opportunity to miss. Placing the Feeder Shelters on the lawn, making sure the sun was shining and that our gorgeous trio of Pekins were adequately fluffy feathered for photos, we got to work. One of our earliest unique designs, the Feeder Shelter / Dustbath is made from our sturdy pressure treated timber and is built to last in any garden, saving flower beds and the lawn from marauding chickens. The reversible base means you can set the unit up as either a dry shelter for a feeder to stand upon or as a dustbath, filled with sand (see below) or topsoil, to allow your hens somewhere to clean their feathers. Arriving in four sections for easy self assembly, a five minute job with a screwdriver, this handy little shelter provides your hens with a clean dry place to 'wash' their feathers. 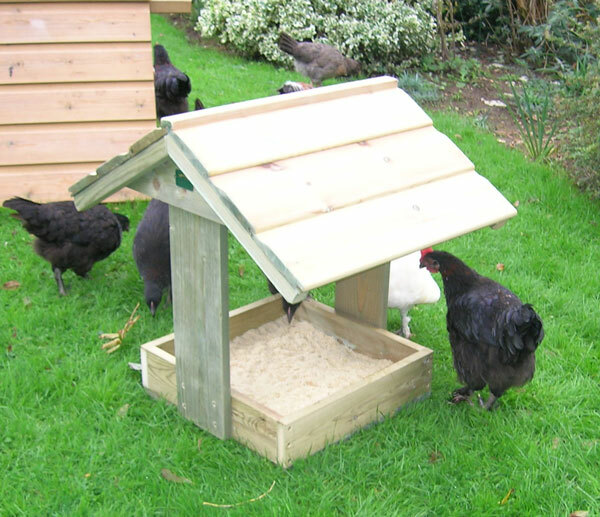 Made from a perfectly formed demi-curve, the Curved Dustbath & Shelter provides stylish shelter for your hens. The arched roof spans the width of the dustbathing tray, providing maximum cover and protection. The tray is reversible to provide a raised feeding platform or a shady spot from the sun, while hooks on the provide a spot for hanging feeders, drinkers and treats. Made from strong tanilised timber and a secret wood bending technique, the Curved Chicken Dustbath and Shelter, provides a stylish spot for your girls in the garden. A good dustbath requires a good quality playsand for your hens to get clean. Chicken Play Sand is a washed and screened silica playsand ideal for use with hens. The pre-washed quality of the sand prevents the staining of feathers, while also allowing rapid draining during wet weather, to allow all year round bathing. Providing a hostile environment for pests such as lice and mites, the Chicken Playsand come in a 20kg bag and is the perfect base going into dustbaths for chickens. 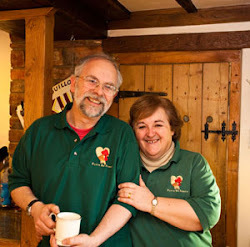 Having taken the photos required and walked the Pekins back to their hen house (the cockerel may have little legs but he can zip when he wants to) it was time to update the decade old photos on the website. Perhaps we will do them again in another ten years. If you have any questions about chickens and dustbathing why not leave a comment below or call us on 01300 345229 to talk to a member of the Flyte so Fancy team. The NEW Flyte so Fancy Catalogue is HERE! As always I've drawn the short straw. Upon opening the box of our new catalogues, it has fallen to me to get them sorted and in their envelopes ready for the postman on Monday. I'm just glad they don't make stamps from gum paper anymore. Once again our Catalouge features all of Flyte so Fancy's signature Hen Houses, as well as its Duck and Goose Housing. From the popular Maggie's Hen House range, through to the stately Floating Duck Lodge, there is a house here for all and any garden. Also getting their own pages are Framebow Animal Housing (who joined the FSF workshop this year) with their stupendous curved timber structures and Dorset Log Stores, providing elegant timber stores for your garden. Jam packed with all the essential, necessary and can't live without poultry products, as well as more treats and goodies than one chicken could ever hope to eat, the Flyte so Fancy catalogue contains everything you need for happy and healthy hens. To request your FREE copy of the Catalogue CLICK HERE now.